On my recent sailing aboard Viking Sky, we were in a deluxe veranda stateroom. Every cabin on every Viking ocean ship has a balcony; there are no interior or porthole rooms. Deluxe verandas are one step up from regular veranda staterooms, but the differences are miniscule. The size and layout are the same, but deluxe get free soda and snacks in the mini-bar and an in-cabin coffee machine. Read my “Into the Midnight Sun” trip reports here. 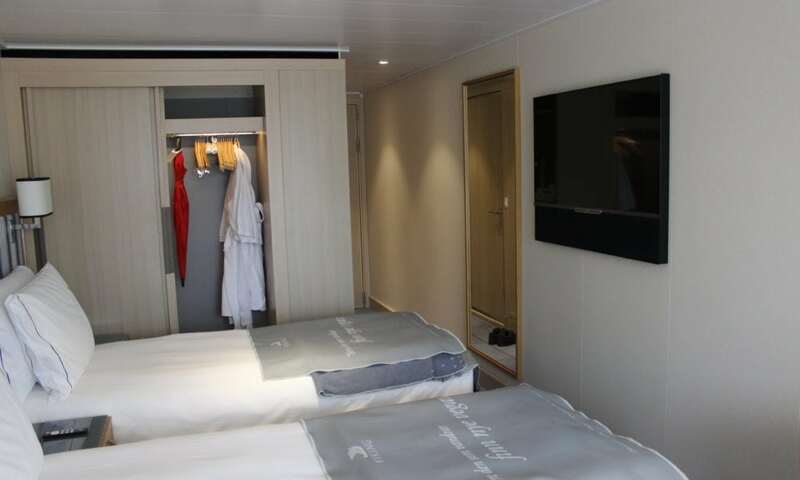 Other cabins on the ship include larger penthouse veranda staterooms, penthouse junior suites, explorer suites, and the largest available – the Owner’s Suite which is 1,319 square feet, includes three bathrooms, and is just steps away from the Explorer’s Lounge at the front of the ship. Here are some photos of our deluxe veranda stateroom on deck 4 aboard Viking Sky. This is what you see when you first walk into the cabin. I was traveling with my mom so we had two beds, but if you requested one they would be pushed together with the nightstands on either side. Each cabin has a seating area with two chairs and a small coffee table, as well as a desk which is also where the mini-bar refrigerator is housed. On top of the desk is the telephone, binoculars, QuietVox headsets which various tours and excursions use, and a carafe of water with two glasses. US and European plugs can also be found on the wall above the desk. One thing I found very useful was the door on the top of the desk that lifts up to reveal storage inside – perfect for keeping makeup or hair accessories hidden from sight and out of the way. Closets have a motion sensor light inside so you can easily see your clothes, and a sliding wooden door that opens from both sides. There are slippers and bathrobes provided, which prove especially useful if you want to stay cozy in the spa. An umbrella is also provided for rainy port days. Also, the nightstands have built-in US and European plugs, as well as two USB slots. There’s no shortage of places to plug things in on these ships! For a cruise ship, the bathrooms are very spacious and I couldn’t have been happier with the fixtures and how they are laid out. Toiletries are provided, even down to shower caps and makeup remover wipes. Instead of having to store everything in the open and clog up the counter space, there are two deep drawers on either side of the sink to put everything in, which I found unusual for a cruise ship but very welcomed. The mirror is lit around the edges and also heated so does not fog. Showers are stand-up with a small ledge and glass door, and are large by ship standards, so you can easily move around without banging your elbows on the sides. I’ve saved the very best part for last: the bathroom floor is heated, too! It’s glorious walking in and feeling the warmth seep into your feet, especially on a chilly morning or when you’ve just stepped out of the shower. TVs in each cabin are flat-screen and basically built into the wall, so they don’t obstruct your walking path around the bed at all. You can catch up on lectures, port talks, or other events that happened during the day on there, as well as see where the ship is and where it’s going, watch the bridge cam to see what’s outside, check your onboard account statement, make reservations, or watch old and current movies and TV shows. There are also a number of live TV channels available to watch. This is a view from outside on the balcony, which included two rattan chairs and a generously sized table. If we had been on an itinerary that sailed in a warmer place, I probably would have sat outside a lot more often. But it was chilly in most of the places we were so I usually went out to take pictures of the scenery we were passing! Hope you’ve enjoyed this tour of my deluxe veranda cabin on Viking Sky. If you want to hear all about my 14-night cruise day-by-day, check out my travel blogs. I have every day up from embarkation in London all the way to Bergen, Norway. Day 1 in London, England can be found here!